The video was shot with Hayabusa2’s small monitoring camera, CAM-H, which points downward from the side of the main spacecraft bus. 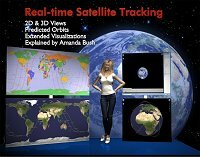 Incredibly, the camera was funded by donations from the public! There’s so much to like about the video: The reflection of Ryugu on Hayabusa2’s shiny surface. The white target marker containing names of Planetary Society members, visible in the lower-left corner for the first part of the video. And, of course, the incredible spray of debris when Hayabusa2 hits the surface and fires its tantalum bullet. With so much material flying around, the team says “the potential for sample collection is high.” That hopefully includes some larger pieces that either floated directly into the sample catcher or were caught on the inner lip of the sample horn, giving them a chance to tumble up into the catcher later. JAXA also confirmed some debris stuck to the lens of one of the optical navigation cameras. NASA’s Mars InSight lander has a probe designed to dig up to 16 feet (5 meters) below the surface and measure heat coming from inside the planet. After beginning to hammer itself into the soil on Thursday, Feb. 28, the 16-inch-long (40-centimeter-long) probe — part of an instrument called the Heat and Physical Properties Package, or HP3 — got about three-fourths of the way out of its housing structure before stopping. No significant progress was seen after a second bout of hammering on Saturday, March 2. Data suggests the probe, known as a “mole,” is at a 15-degree tilt. “The team has decided to pause the hammering for now to allow the situation to be analyzed more closely and jointly come up with strategies for overcoming the obstacle,” HP3 Principal Investigator Tilman Spohn of DLR wrote in a blog post. He added that the team wants to hold off from further hammering for about two weeks. The SpaceIL Beresheet lunar lander spacecraft takes a picture of itself along with the Earth in the background. Yutu-2 awakened for lunar day 3 of the mission at 02:51 UTC on 28 February, with the lander following later the same day at 23:52. A few days later, the rover stood down for its ‘noon nap’ to avoid heating issues from a high solar incidence angle, at 10:25 UTC on March 3. It will resume its activities early on 10 March, before entering a sleep state around 02:00 UTC on 13 March, when the Sun is low in the sky over Von Kármán crater in preparation for the lunar nighttime. According to a release by the China Lunar Exploration Program (CLEP) on 4 March, Yutu-2 has so far travelled 127 meters, adding 7 meters to the total of 120 meters driven on lunar days 1 (44.185 m) and 2 (75.815 m). The apparent relatively low distance is believed to be due to Yutu-2 taking time to image nearby rocks and features in the regolith. Analysis of the images from the Visible and Near-Infrared Imaging Spectrometer (VNIS) and Panoramic camera is expected to provide insight into the origin and composition of the rocks and development of the lunar far side itself. Yutu-2 observes some Moon rocks during the rover’s third Lunar Day since landing on the far side. NASA has selected 12 science and technology demonstration payloads to fly to the Moon as early as the end of this year, dependent upon the availability of commercial landers. These selections represent an early step toward the agency’s long-term scientific study and human exploration of the Moon and, later, Mars. The November release imaged three pits found on the southern flanks of Arsia Mons. The January 2019 release found several north of the volcano, two of which are very close to the two middle new pits highlighted above. The February release, which is the focus of this post, included four more pits, shown above, all located north and west of Arsia Mons, as shown in the overview map [shown below in image from Behind the Black]. 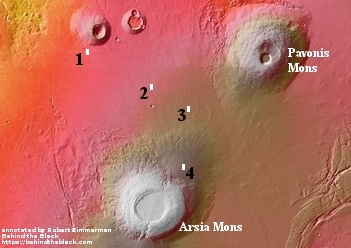 MRO images of Arsia Mons with notation by Bob Zimmerman. The number of sunspots in the current cycle since 2008. Annotated by Bob Zimmerman. Jupiter’s northern hemisphere as seen by Jupiter in an image enhanced by citizen scientist Kevin M. Gill.